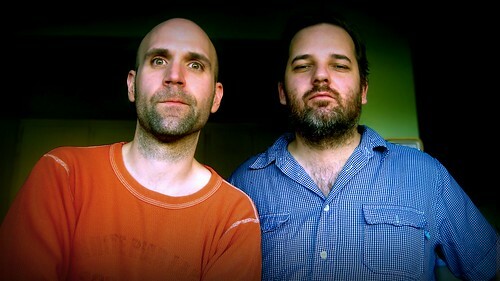 We met Dan Harmon and Rob Schrab in 2007 when we invited them to give the closing keynote at Pixelodeon. They delivered a memorable talk about the process of creating Channel 101, a website founded in 2003 that invites comedy filmmakers to create pilots for original short web shows which are then screened for an audience who votes on which shows get a return engagement. Dan and Rob took the idea for Channel 101 to television with Acceptable.tv on VH1, and they have also been creating other awesome tv shows, like The Sarah Silverman Program on Comedy Central, which they co-created with Sarah Silverman. They also wrote the screenplay for Monster House, which won the 2007 Oscar for Best Animated Feature. Dan and Rob talked with us for a long time about breaking into Hollywood and their views on the way the online world is shaping the future for content creators. Channel 101 has been a launching pad for some really great comedy videos and video makers, and it certainly helped the guys from The Lonely Island get their careers going. Dan and Rob both started out with stand-up as part of the improv troupe The Dead Alewives in their hometown of Milwaukee. They were also immersed in the world of comics with the self-publshed Scud, which was a critical success. Check out the extended interview embedded at the top of this post for answers to the Twitter questions that the online audience asked while we were there, check out their Pixelodeon keynote embedded below, and you can get more from Dan on his blog and his Twitter, and from Rob on his site.